As Democrats, after a Sunday rally on the Capitol grounds, marched to the House hand-in-hand to vote health care reform, Tea Partiers reportedly shouted the "n-word" at John Lewis and another black congressman. A third was allegedly spat upon. And Barney Frank was called a nasty name. Other Democrats say their offices were vandalized and they've been threatened. A few received, and eagerly played for cable TV, obscene phone calls they got. "How curious that a mob fond of likening President Obama to Hitler knows so little about history that it doesn't recognize its own small-scale mimicry of Kristallnacht." Kristallnacht, "Crystal Night," the "Night of Broken Glass," was the worst pogrom in Germany since the Middle Ages. Synagogues were torched and hundreds of businesses smashed. Shattered glass covered the streets. Women were assaulted and men beaten and murdered. After that terrible night, half the Jews remaining in Germany fled. Not since the Civil Rights Act of 1964 made "some Americans run off the rails," said Rich, have we seen anything like this. Was Rich awake in 1964? Because it wasn't the right that went off the rails. The really big riot in 1964 was in Harlem, lasting five days, with 500 injured and as many arrested. The Watts riot in 1965, Detroit and Newark in 1967, Washington, D.C., and 100 other cities in 1968, all bringing troops into American cities, were not the work of George Wallace populists or Barry Goldwater conservatives. They were the work of folks who went "all the way with LBJ." Nor was it Young Americans for Freedom that burned ROTC buildings, vandalized professors' offices, toted the guns at Cornell or took over Columbia in 1968. And it was not the Birchers who set off that 1970 explosion in the Greenwich Village townhouse that killed three radicals and aborted the terrorist bombing of the NCO club at Fort Dix. No, this was not the New Right. This was the New Left, and it was Obama not John Boehner who used to "pal around" with one of the boys who did the Pentagon and Capitol Hill bombings. As for calling Barney Frank a naughty name, that is not nice. But one wonders what Rich thought of the students marching under Viet Cong flags chanting, about the man who signed that Civil Rights Act, "Hey, hey, LBJ, how many kids did you kill today?" and, "Ho, Ho, Ho Chi Minh, the NLF is going to win," when American boys were dying in the hundreds every week fighting the communist NLF? The 1967 attack on the Pentagon, where thousands tried to break through military police to get into the building, was the work of left-wing radicals. 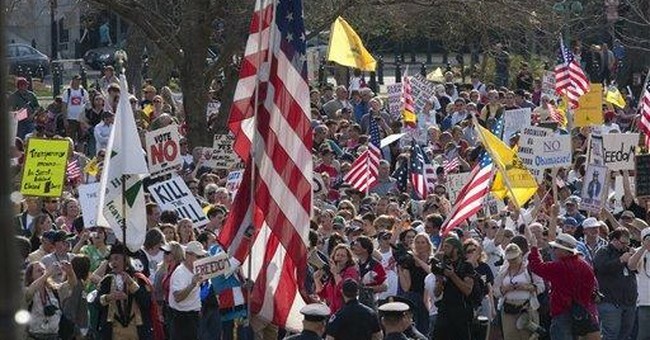 Did the Tea Party folks who chanted, "Kill the bill," outside the House behave worse than that? The "mass hysteria" of the Tea Party right, writes Rich, is at root about race. "By 2012 ... non-Hispanic white births will be in the minority. The Tea Party is virtually all white. ... Their anxieties about a rapidly changing America are well-grounded." Rich is implying that when America's white majority disappears, in 2042 according to 2008 Census Bureau projections, the day of the white conservative is over.